A private investor has snapped up around 450sqm of prime, ground floor retail space at the new 568 Collins Street project in the Melbourne CBD. Colliers International’s Daniel Wolman and Oliver Hay have negotiated the sale of a whole ground floor of retail under approximately 600 apartments at 568 Collins Street, Melbourne, on behalf of Stamoulis Property Group. Mr Wolman and Mr Hay are now turning their attention to managing the sale of 1,500sqm of strata office space over 10 levels at 568 Collins Street. “This is state-of-the-art strata office, all with outstanding views over Collins Street,” Mr Hay said. “On offer is complete Collins Street frontage and outstanding features such as glass floor-to-ceiling windows. With direct access to Collins Street trams and Southern Cross Train Station and in close vicinity to both the legal and financial precincts, Mr Hay said 568 Collins Street offered the best strata offices available for purchase in the Melbourne CBD at present. “There’s nowhere better to buy strata in this low interest rate environment, with the added incentive of saving on stamp duty by buying off the plan,” he said. Off the back of Wolman and Hay’s successful sale, the sales team have worked with Colliers International’s retail leasing team to secure an exclusive appointment on the retail component of 568 Collins Street. Ben Tremellen, Cam Taranto and Georgie Cichy are leasing approximately 450sqm of retail fronting Collins Street. Two tenancies are under offer at 568 Collins Street, with an additional three tenancies remaining. Across the road, Colliers International has secured full occupancy for the new landmark retail precinct, The GRID, at 567 Collins Street. High demand for retail, coupled with strong strata sales activity in the CBD, is expected to drive interest in office space at 568 Collins Street. Mr Wolman and Mr Hay currently have just one more suite at Lifestyle Working Collins Street (838 Collins Street) under offer on behalf of Lend Lease. Wolman and Hay have been the lead agents that have helped Lend Lease achieve the sale of 136 of 137 suites. Mr Wolman and Mr Hay also recently sold Level 1, 140 Bourke Street for $2.21 million on behalf of a private investor, in a landmark deal for strata office space in the Melbourne CBD. “We are witnessing a spike in demand from businesses who want to purchase and own their premises rather than lease, encouraged by ever-low interest rates,” Mr Wolman said. “Office owners are finding it easier to pay off their mortgages quickly and can see the added value in capital appreciation of CBD strata offices. 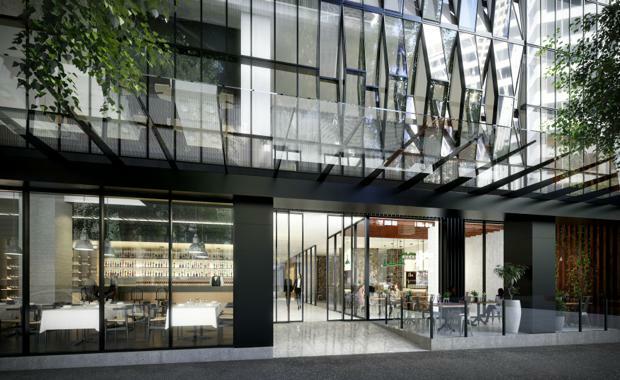 568 Collins Street is currently under construction and expected to be completed by the end of June.